Just a quick reminder that, if the MSPL is an option for you next year, April 15 is an important deadline. Completed applications received before or on April 15 will be considered for all of the MSPL’s scholarships. We have two $5000 blogging scholarships (so you could be writing these awesome blog posts next year instead of me! ); and two $5000 scholarships for engineers (financed by ND alum Matt Connors). And please feel free to contact Program Coordinator Cathi Kennedy (ckenned7@nd.edu) or Program Director Karen Deak (kdeak@nd.edu) with any questions. The MSPL hit Washington, DC, this year for our Spring Break trip. Rose, Elaine, Josh, Joseph and David came along, and we had a very busy week. We spent a whole day at the USPTO (and saw an Inter Partes Review), visited quite a few law firms to hear about their patent prosecution practices, went to BIO to learn about careers in science advocacy for IP specialists, and finished it off at the NIH / NIAID, where we talked about tech transfer. 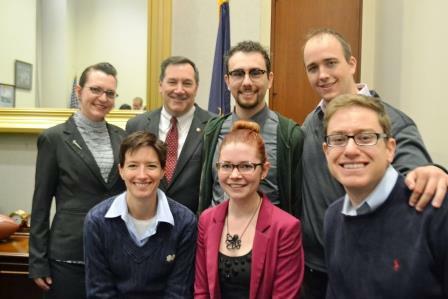 One of the highlights of the week was a visit to our state Senator’s office, where we actually got to meet Senator Joe Donnelly. He told us about his own experience with the patent system — he received a letter from a patentee alleging infringement, and he had to pay them some money so they wouldn’t sue him. If you don’t follow our Twitter or Facebook, it’s worth a glance to see what fun we had this week — the students took over the feed and thoroughly enjoyed keeping everyone up to date on their shenanigans. 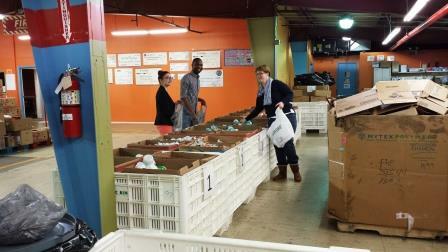 Last week, two MSPL students and Cathi and I spent a couple of hours volunteering at the Northern Indiana food bank. That place is MASSIVE — I had no idea how big it is, or how many people and agencies it services. It’s two floors of a gigantic warehouse, all dedicated to storing and distributing food to those in need. Our job was to prepare meals for students to take home over the weekend so they don’t go hungry. As you can see in the picture below, the Food Bank has a great system set up — you go down one side, where Rose and Travis are, putting one of each item into a bag, and then tie the bag up and drop it in the bin at the end. Repeat on the other side (demonstrated by Cathi).